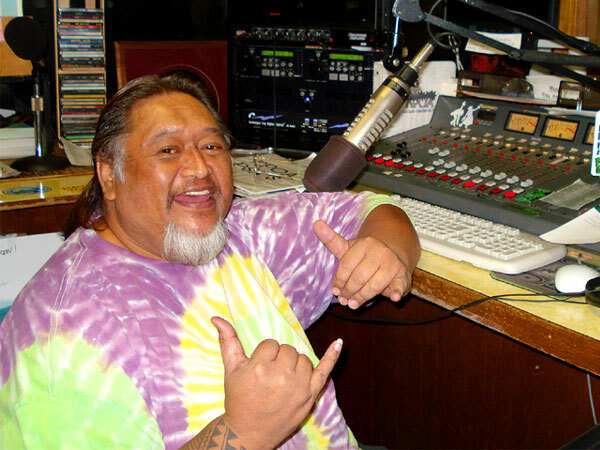 Henry “Boy” Kana‘e went on air as “Da Maui Hawaiian Supaman.” He died Monday of heart failure at age 55. Deejay Henry "Boy" Kana'e was a pure soul, who enjoyed reading the Bible, taking his grandchildren holoholo (cruising) and helping people, his older daughter said Tuesday. Sherise "Honey Girl" Kana'e, 32, a Hilo social worker, said, "He loved anything that was church oriented. He was always reading his Bible. "He liked doing stuff with his grandchildren. He would take them go see Maui Ocean Center and take them with him to do his emceeing, especially my oldest son, Kai, 16." Boy Kana'e, who went by the radio signature of "Da Maui Hawaiian Supaman," died Monday of heart failure at Maui Memorial Medical Center, his daughter said. He was 55. Although family members had not confirmed a site Friday, they have set service times and dates. The wake will be held from 4 to 9 p.m. Dec. 26, and from 9 a.m. to 1 p.m. Dec. 27. Ballard Family Mortuary is assisting with the arrangements. Kana'e's health had faltered recently as a result of water retention, gout and difficulty breathing during periods of vog. He had stayed home sick since last Wednesday, the daughter said. He had weighed 500 pounds a couple months ago and had gained more weight recently, she said. But his heart matched his girth, friends and co-workers agreed. Fred Guzman, program director of radio ESPN 550 and Fox News 900, said simply, "Big man, big heart." Filmmaker Ken Martinez Burgmaier, co-producer with Kana'e of MauiFEST Hawai'i movie events, said the two were close partners for a decade. "We had a great working relationship as well as a friendship that will be with me till the day I die," Martinez Burgmaier said. "He had the biggest aloha heart I've ever experienced. He passed it along to people, and people got it. "I don't think we'll ever find a more giving Hawaiian than Uncle Boy Kana'e." Kana'e was born Oct. 27, 1954, in Keokea. He graduated from Molokai High & Intermediate School and joined the Army for a half-dozen years, with assignments in Europe and Asia. He learned to speak German, Turkish and Italian, according to a 1997 Maui Weekly feature on the "popular radio personality." Kana'e returned to Hawaii from the Army in 1977, when the Protect Kaho'olawe 'Ohana movement and Molokai activist Walter Ritte "made me aware of my heritage culturally," he had said. He married Sharon Mokiao of Kapaakea, Molokai, and they had three children. His career included some two decades in social services, with positions as a teacher and counselor at the Corbett House facility for runaways at Palama Settlement on Oahu; outreach coordinator working with kupuna under the auspices of Alu Like; Maui manager of the Aloha Festivals program; and associate pastor of Harvest Chapel. He worked as a disc jockey for radio KPOA FM 93.5 since 1994. Honey Girl Kana'e described her dad as "a sweet and kind man. He always had a positive outlook on things, no matter what it was." "He's always willing to help, you know, whenever. He just touched a lot of people's lives in one way or another." His community involvement ranged from serving on the Community Work Day board of directors to volunteering with Alternatives to Violence, Salvation Army, Maui Jaycees and the Maui Arts & Cultural Center. Before his wife died of cancer in 2000, Uncle Boy had remarked, "She knows who I am and what I do. . . . She's my best friend. I'm just a Hawaiian man, a Hawaiian boy. "Gotta be Hawaiian," he had added. "Gotta walk in alohas. That's what it's all about: aloha." Mayor Charmaine Tavares sent her condolences to the family late Tuesday. "His aloha will surely be missed," she said. Maui County spokeswoman Mahina Martin said the death of Kana'e "was really surprising. That was really, really sad. He was one of the few who were of old Hawaii, where you're either related or a friend." He is survived by a son, Leighton Kana'e; two daughters, Sherise "Honey Girl" Kana'e (Kenika Kane) and Jazre Malanai (Sione) Sunia; his mother, Yvonne Kana'e; four brothers, Clarence Kana'e, Clayton Kana'e, Garrick Kana'e and Nathan Kana'e; and four grandchildren. Besides his Supaman signature, Kana'e had a signature motto that recognized that one's heart is tucked into the left rib cage. "If it's not going right, take it to the left," he was wont to say. "Whatever you're doing, if it's not going right, take it to your heart. Your heart is love; love is God. "If you always follow your heart, you'll always get love and you'll always get God.